View the Panel through 3D glasses to watch the fish come to life! 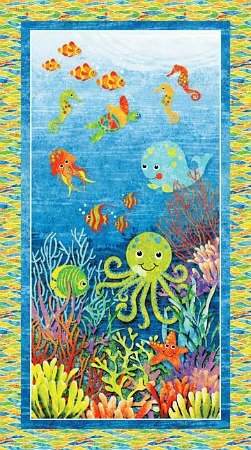 3D undersea Panel, Stonehenge Kids 3D Underseas Adventure Collection designed by Linda Ludovico for Northcott Fabrics. Fabric appears 3D when you look at it through the3D glasses. You will get one free pair of 3D glasses with every Underseas Adventure PANEL purchase.